Our Wooden Wagon Cart Is A Kind Garden Planter. With Its Rustic Design And Antique Look, You Will Complement Your Outdoor Décor. The Fir Wood Construction And Burn Finish Will Give You The Style You Have Been Looking For In Your Garden. Its Four Rolling Wheels Will Help You Move It Easily. The Width And Long Length Of The Wagon Cart Will Securely Hold Your Plants In Place. Do Not Hesitate To Buy One!  A Kind Garden Planter For Planting Flowers And Plants.  With Rustic Design And Antique Look, A Decoration To The Outdoor Living Space. Solid Fir Wood Construction, Sturdy And Durable. With Four Wheels For Easy Moving. Wide Enough For Hold Your Planters. 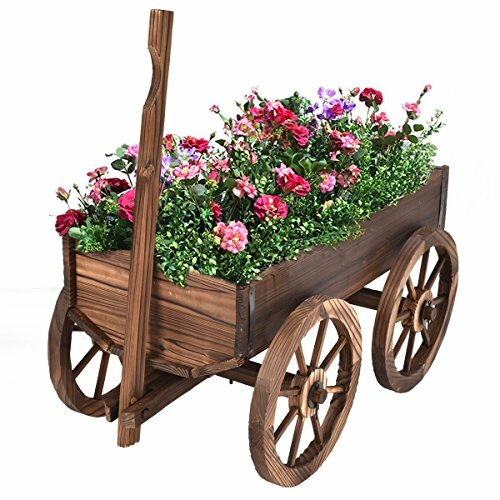 Handle Dimension: 25.6" ,Diameter Of Wheels: 11.8"
【Functional Planter and Beautiful Ornament】Wagon cart has a large and deep barrel planter for planting flowers or other plants. Characterized by rustic design and antique look, our flower planter is also a perfect outdoor décor in your patio, garden or backyard. 【Durable and Solid Wood Frame】Constructed of solid fir wood and handled with burn finish, the wagon cart planter is weather-resistant and serves longer time. Natural and sustainable material perfectly matches your garden or patio style. 【Easy To Move】With four wheels and one long wood handle, it is convenient for you to move this cart planter in your backyard or patio. 【Easy to Install】Complete hardware and assembly manual are included. Detailed installation steps are shown in picture and text form for your reference. If having any problem while assembling planter, you can also feel free to contact customer service. 【Ample Planting Space】 The width and length of the barrel planter will securely hold your plants in place. It provides spacious room for you to plant different flowers or plants. Perfect depth kindly protects flowers' roots and enables them to healthily grow.